Leg, calf, what? Legg-Calve-Perthes is a disease that you have probably never heard of but will want to know about if your young dog starts limping and you don’t know why. Legg-Calve-Perthes disease, also known as LCPD or LCP disease, is a developmental orthopedic disease that affects dogs. LCPD refers to the spontaneous degeneration of the femoral head, the top portion of the femur leg bone. Degeneration of the femoral head, causes the bone to die and collapse and leads to arthritis. LCPD was named after the orthopedic surgeons who identified it, says the American Association of Orthopaedic Surgeons: Arthur Legg, Jacques Calve, and Georg Perthes, who studied this orthopedic condition in young children during the early 1900’s. Who is affected by Legg-Calve-Perthes disease? LCPD primarily affects young animals, especially terrier and toy breeds such as West Highland White terriers, Cairn terriers, Scottish terriers, Manchester terriers, toy poodles and miniature pinschers. The disease is typically seen in dogs between 5 and 8 months of age. It equally affects both male and female dogs. The cause of LCPD remains unknown, but many theorize that LCPD develops when the synovial vessels that supply the femoral head become compromised. The lack of blood flow to the femoral head leads to the death of bone and cartilage cells. As a result, the affected area does not develop properly and becomes weakened. The femoral head of dogs with LCPD deteriorates and can fracture or collapse even during normal activities. Ultimately, this leads to pain and arthritis in the affected hip joint. Legg-Calve-Perthes disease is diagnosed radiographically. 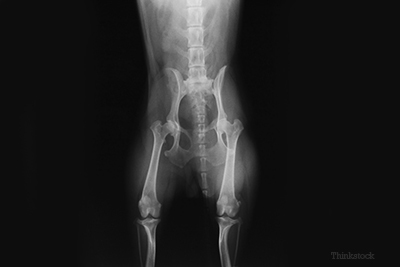 Based on your dog’s symptoms, your veterinarian may recommend obtaining an Xray of your dog’s hips and rear legs. If your dog has LCPD, the radiographs will show degenerative changes to the femoral head and neck and a fractured or collapsed femoral head with more advanced cases. The treatment of choice for LCPD is surgery to remove the affected femoral head and neck with a procedure called a femoral head and neck excision (FHNE). While it’s hard to imagine how a dog would get around after this type of surgery, the fact is that most dogs do incredibly well. Not only is pain from LCPD relieved (after they recover from the surgery) but most dogs can run and frolic as they used to. The secret to a complete recovery is to adhere to a rehabilitation plan that may include walking, swimming, and physical therapy. For more information about Legg-Calve-Perthes disease or to see if your puppy could be at risk for LCPD speak with your veterinarian.